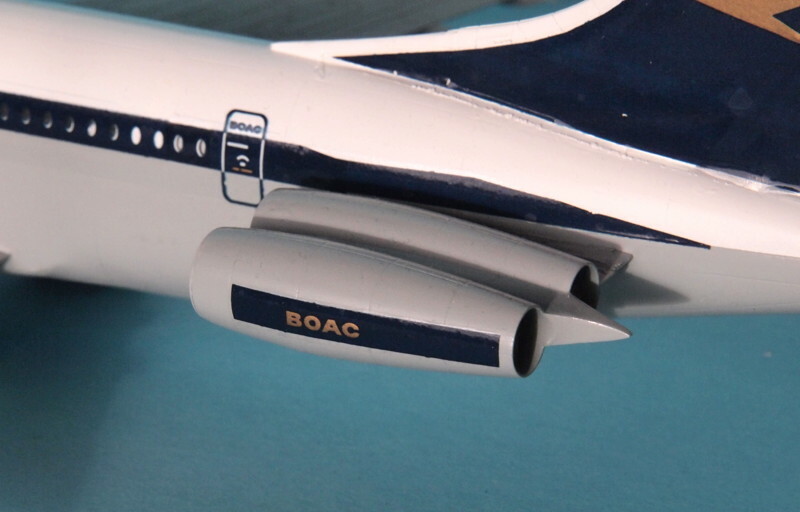 in 1965, BAC proposed a double-decker version of the VC-10. This would mate a new fuselage with the Super VC-10 wing and tail unit, and RB.178 Super Conway engines of 27,500 lb thrust. Capacity would be 265-286 seats. 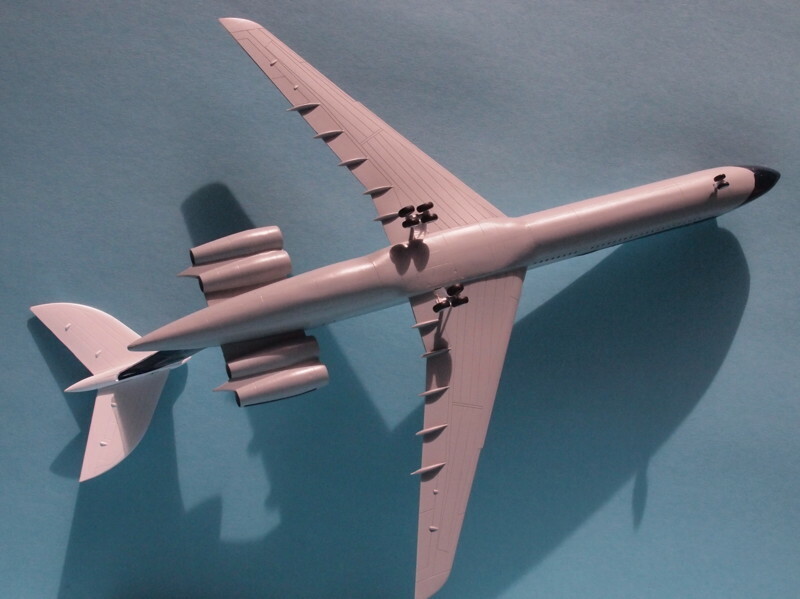 The new fuselage would have as much commonality with the VC-10 as possible, e.g. 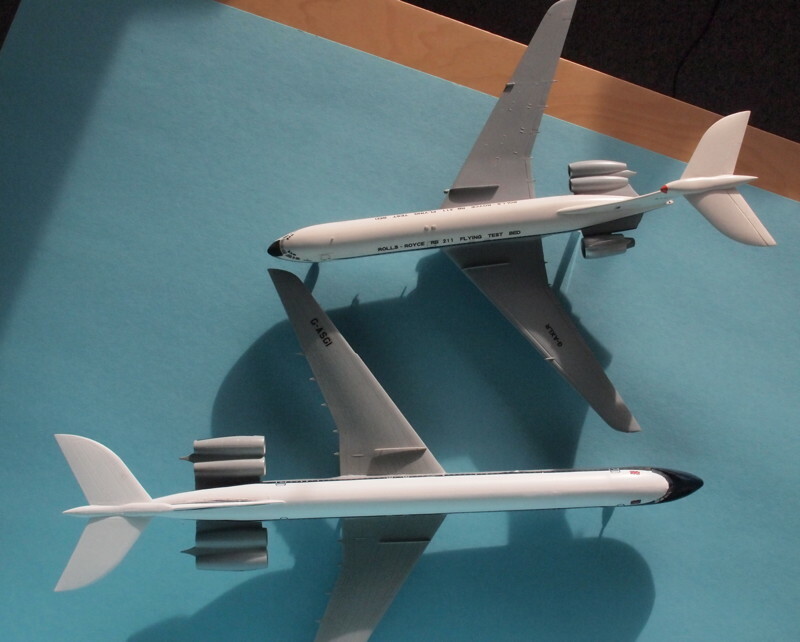 the fuselage sides of the lower bubble would be identical to the VC-10 ones. This version would have had better economics than the VC-10 (the wing which was overkill for the VC-10 came into its own here). Oh, you bet I'm keeping my eye on this one. I love it already. What's the size of this baby? 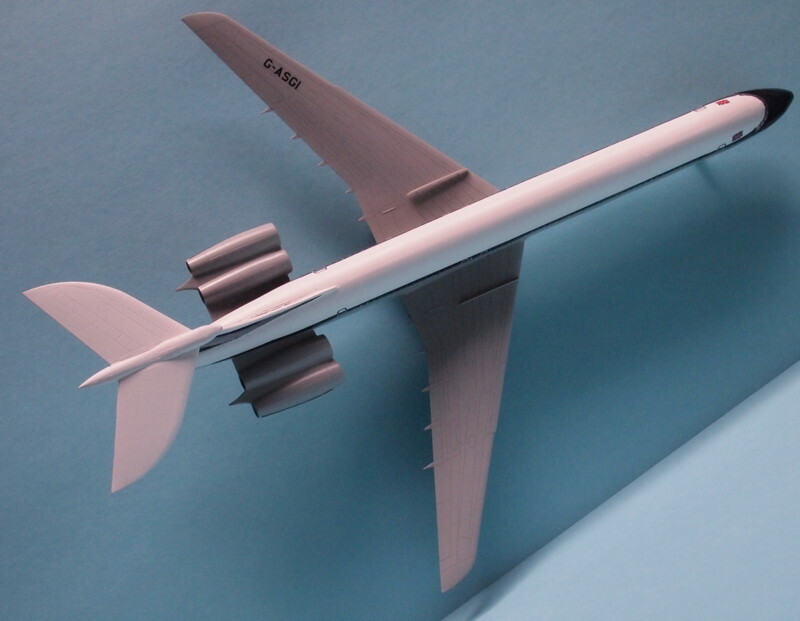 Fuselage length is 37 cm. Scale 1/144. Curiously enough, a few days I ago I was comparing the VC-10 with the 757 and 767. It actually comes in marginally heavier than the original 767-200 ( 147 versus 136 tonnes MTOW ) but has about 80 sq ft less wing area than the 767. Aspect ratio is also lower for the VC-10, 7.4 versus 8.0. 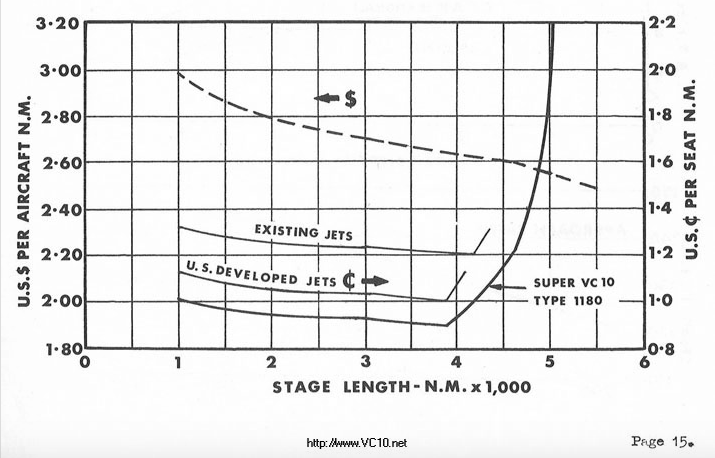 And even the 707-320 only had 40 sq ft less than the VC-10. I do wonder sometimes if the hot and high 'compromises' are exaggerated in order to cover for the fact that it just couldn't compete with the Boeing marketing machine. What brand of putty are you using? I will buy some shares of the society. That looks a pretty complex build, best of luck with it. Good Lord!! This looks nutty, I love it. I've more or less finished this (and I got it done in time for Telford). There are a few items I still need to sort out (the decals need repairs). Next to a standard VC-10 (the RB.211 test bed G-AXLR, based on the Airfix kit), you can see it's much longer. If you look back at the photos at the start of this thread, I hacked up the Roden kit (which is a Super VC-10) and inserted 2 fuselage sections, totaling 17 windows. Lovely! What a great model! REALLY impressive work there Harro.